Disconnect the harness connector from EVAP canister control pressure sensor. Remove the EVAP canister control pressure sensor and O-ring, if necessary. Disconnect EVAP canister purge hose. Disconnect fuel tank EVAP breather hose. Disconnect the harness connector from EVAP vent control valve. Disconnect the EVAP vent control valve hose. 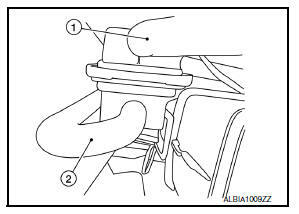 Remove the EVAP canister bolt. Remove the EVAP vent control valve and O-ring, if necessary. 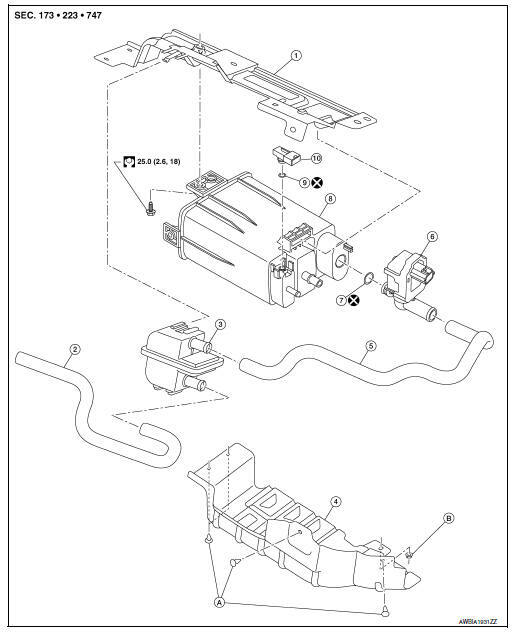 Disconnect the EVAP control pressure sensor harness connector (1). Remove the EVAP canister control pressure sensor and O-ring. 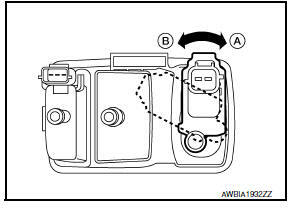 Turn EVAP canister vent control valve counterclockwise. Remove the EVAP canister vent control valve and O-ring. Disconnect the EVAP canister filter drain hose (1). Disconnect the EVAP hose (2). Remove the EVAP canister filter.